Most people think of rapid growth and modern development when the GCC region is mentioned, but the region has got much more to offer. Beautiful exotic landscapes and natural wonders are various in the GCC, each spot offering a unique kind of beauty. Let’s take a closer look at the abundant natural beauty that this diverse piece of land is home to. 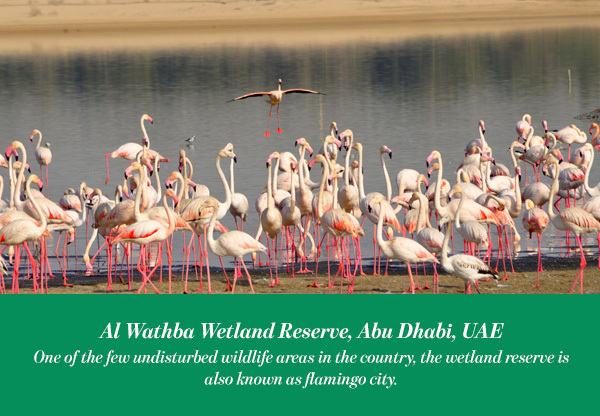 One of the few undisturbed wildlife areas in the country, the wetland reserve is also known as flamingo city. Al Wathba wetland reserve is located on the edge of Baniyas, it is off the beaten path but totally worth finding. The reserve is a complex of natural and manmade water bodies, it was established in 1998 and was declared a Ramsar site in 2013. If you want to escape the city life and find some peace observing flamingos, this is the place to go. Over 80 million years old fossils make this place a once in a lifetime surreal experience. Also called Jebel Maleihah, the place is very popular with both locals and tourists, especially during weekends. To get to Fossil Rock you need to drive down the Dubai- Hatta road through to Al Awir. 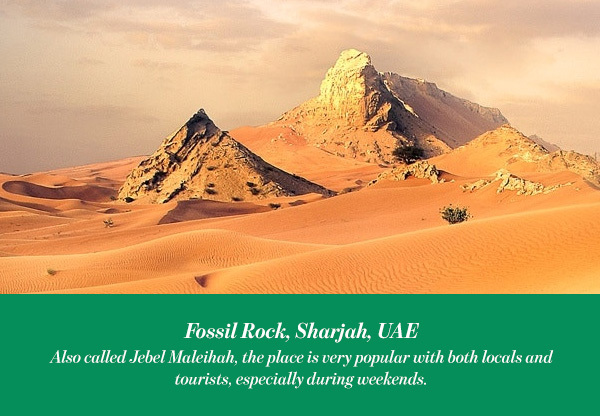 It is definitely one of the UAE’s natural wonders, and a remarkable spot in the GCC. Sitting among fossils that are over millions of years old, enjoying clear blue skies, rocky hills and pristine dessert sand provides an unforgettable day. 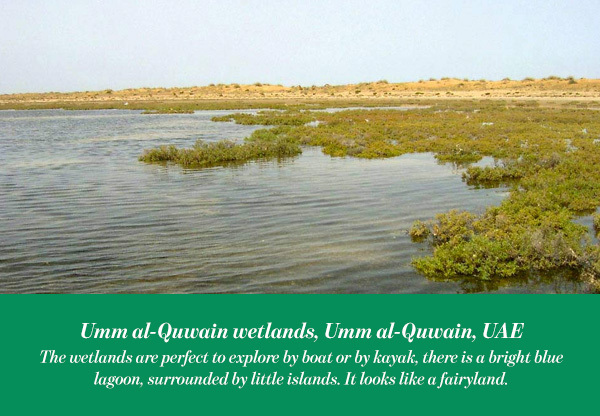 The emirate of Umm al-Quwain is one of the most beautiful places in the UAE. The wetlands are perfect to explore by boat or by kayak, there is a bright blue lagoon, surrounded by little islands. It looks like a fairyland. These islands are perfect locations for bird watchers, especially the mangroves and the water channels between the islands. In winter time more than 300 different kinds of birds can be seen in the islands. At the same time you can view thousands of flocks flying offshore. You can go there to observe rare birds or just to enjoy a magical natural gem in the heart of the GCC. Bahraini pearls are considered to be some of the world’s finest and if you want a truly authentic experience you should try diving for them. Al Dar Island offers snorkeling trips where you can snorkel and look for oysters which flourish in the shallow, clear waters. The good news is, if you find a pearl while snorkeling, you get to keep it. Aside from the actual dive for pearls, this trip gives you an opportunity to see some of the sea life in the gulf. You will also see a historical shipwreck and any number of dolphins during those trips, how cool is that?! Wadi Hanifa is a valley among dramatic cliffs and vast rocky terrain, it creates a natural haven in the midst of Saudi Arabia’s cosmopolitan capital. The government has implemented a comprehensive development strategy for the valley, it aims to develop Wadi Hanifa as an environmental, recreational and tourism resource. Thanks to that development strategy the Valley is well-maintained and extremely accessible, and you will not have to worry about facilities. You can enjoy the late afternoon hours under the shade of rich date palms and then watch the sun disappearing behind rocky mountains. 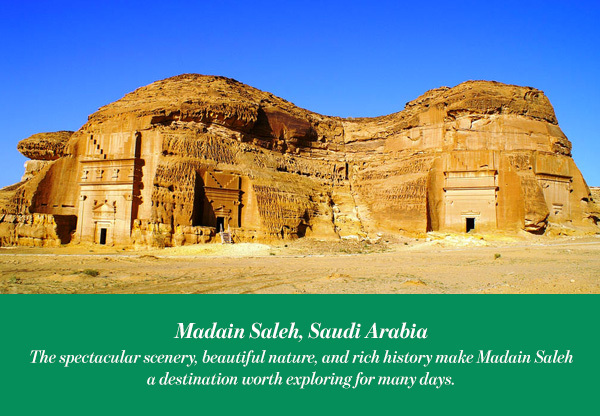 The spectacular scenery, beautiful nature, and rich history make Madain Saleh a destination worth exploring for many days. Madain Saleh is the home of the tombs of the ancient Nabatean people, plus, the Hejaz railway built by Ottomans runs through it. In addition to that, nearby town Al-Ula boasts a beautiful oasis, museums, an old mud village and ruins and tombs of Khuraibah. 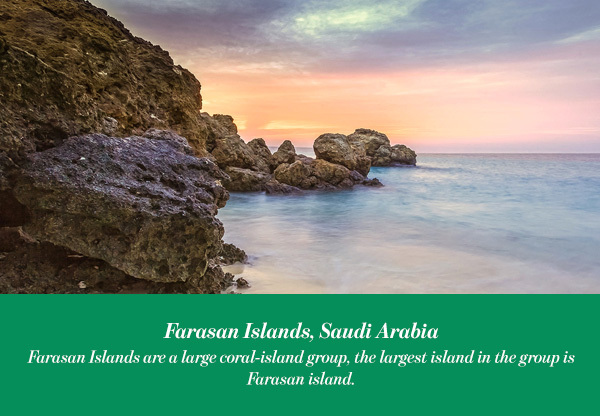 Farasan Islands are a large coral-island group, the largest island in the group is Farasan island. The islands have more to offer than beautiful beaches and amazing diving spots. Farasan island is a beautiful natural habitat, it is a bird watchers paradise and is also home to endemic Gazelle species. Moreover, there are numerous historical sites on the main island.